Looks great! I don't know if I can pull of the red look, but you look great! i have been so tempted to go red again lately but the fading is always something that has bothered me. 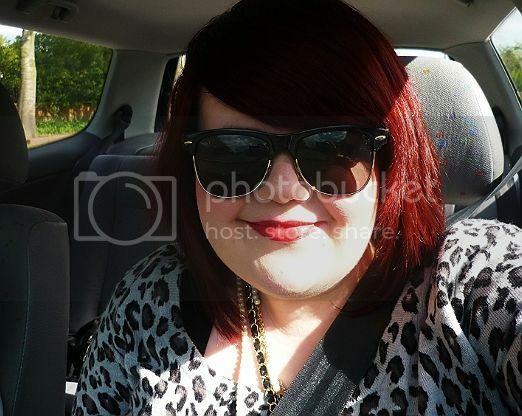 I'm often a very dark auburn - I especially love to go for a reddish day around autumn time. My hair is naturally very close to black, so it often comes out looking just black but when it catches the light just right it will look fiery, which I love! Manic Panic is a really good way to keep full colored hair a bit more fibrant and not so fast fading. I also loved their colors. And I also used the violet plum color from Schwarzkopf XXL Color and liked it alot. Gazel M: There's a red for everyone! If it's not vibrant, even a warm red on dark hair looks amazing in the light! I love red hair on people! It looks great on EVERYONE! Red hair is great, but the best way to keep it read is to dye it with Elumen. It really stays red. Love it. Ah, Manic Panic! 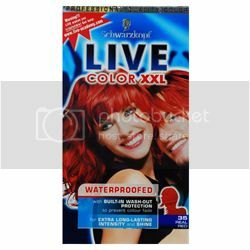 I used it to dye my hair red in the 9th grade and didn't have such a great experience. At the time, my hair was pretty damaged. I'd bleached it twice and dyed it a boring shade of brown when my mom forced me to change my jet black hair before high school. Months later, I decided to try semi-permanent dye to keep from further damaging my hair. I applied the Manic Panic, but when I rinsed and dried my hair I was horrified! My healthy roots had barely absorbed the color, while my damaged ends were practically florescent! I blame my hair, not the dye, for the two-toned color. I recently went back to being a redhead--this time, from roots to ends!--so I found your tips very helpful. Tamara: Thank you, I hope you found them useful! doublevodkacoke: Oh yeah I've noticed that before - but it for me it's always faded slightly lighter after a couple of washes. I think it depends on the original colour you started with underneath. Your hair looks great : ) I have brown hair and it is a pain! The upkeep on dying is so difficult. I should dye it myself like you. Very smart. I've used that red hair dye, in streaks, but now I wish i'd dyed it all red as i really like the colour! Thank you SO much for this...I love red hair but am always disappointed at how quickly the colour fades. These are some awesome tips, I think I'm going to buy the Live XXL dye on Ebay (can't get it in Canada...booo!). Great post, really useful tips for natural redheads as well.will look for the John Frieda ones asap! Im a newly Red head ( using loreal feria spice power) and I love the colour but it fades so quick and I don't wash it for than twice a week( i am a natural blonde and it fades pink) I try to go at least 4 days before washing and I use dry shampoo and hairspray, just bought some manic panic and I'm gunna give that a go.I get very paranoid about fade as i am a very busy person. Hi. I was looking on some tips for red hair and came across your blog. :) I've got just one question - doesn't Manic Panic damage your hair? You've said you're keeping in for a few hours, but it's a hair dye, right?